By now, with all of the rhetoric surrounding the political infrastructure of our nation, I am sure you are fully aware that there is power in a brand. Rather you are a fan of the Trump administration or not. He had always had a façade that many are aware of or have at least heard of before he was President. Now that he has the 45th slot in our presidential repertoire, He is part of what shapes the nation's brand. 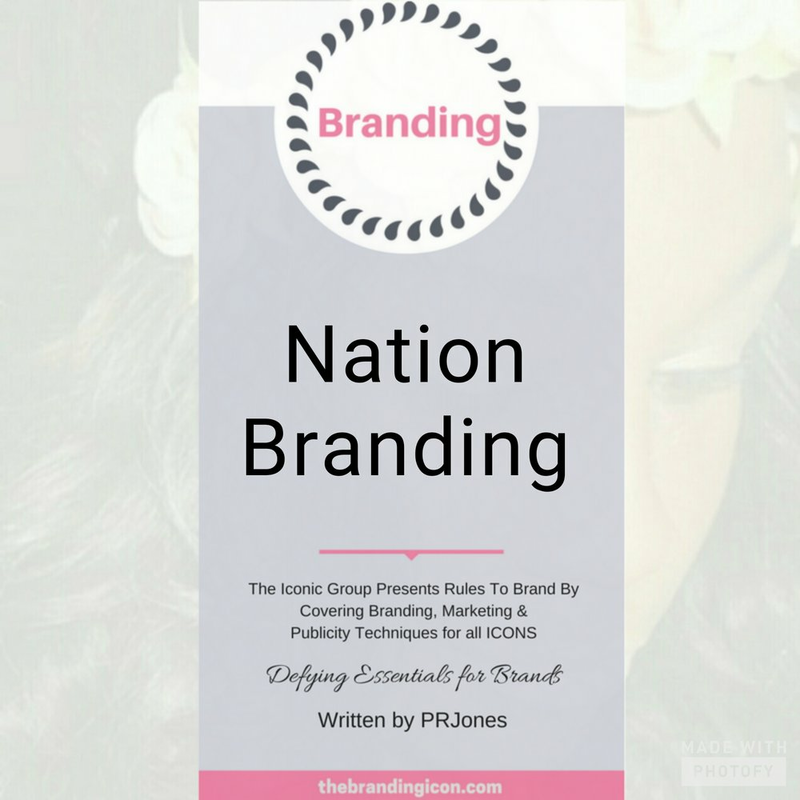 Nation Branding is a form of branding that focuses on building the reputation of countries. Any country, at any point in time, can consider this facet of branding. Whether it's through pursuing advertising initiatives for a stronger tourism market or if it's in selling your countries military experience to a younger demographic, considering your nations brand is pivotal to every citizen it serves. Nation Branding was first created in the book "Diplomacy in a Globalizing World: Theories and Practices. The author describes this technique as "the application of corporate marketing concepts and techniques to countries, in the interests of enhancing their reputation in international relations.” Extending to public and private sectors, you can think of this form of branding as a signification of nationalism. Showcasing the country in its "brand image" not only increases the importance of the symbolic value of the nation's product but also to emphasize the countries distinctive characteristics. Wiki states "The branding and image of a nation-state "and the successful transference of this image to its exports - is just as important as what they actually produce and sell. "This is also referred to as the country-of-origin effect." The economic vitality of the nation is what most nation branders shoot for through a successful image and a well-strategized reputation. As time passes, and technology improves the importance of this type of branding and place branding will also progress. Futurebrand is responsible for publishing the Country Brand index every year which includes an overall ranking of 75 countries. Nation branding is practiced by many countries like United States, Canada, France, United Kingdom (where it is officially referred to as public diplomacy), Taiwan, Malaysia, Japan, China, South Korea, Singapore, South Africa, Australia, New Zealand, Israel and most Western European countries. Permission Marketing is a new technique, 1999 to be exact, that inspires an audience to want to hear from you. This method (and book) written by Seth Godin covers how permission marketing is a “privilege” (not a right) of delivering anticipated, personal and relevant messages to an audience that wants to hear from you. This technique is non-traditional however it is extremely popular among thought leaders in the branding and marketing world today. Once the consumer opts in to receiving a brand's content it is a grant of permission into the user’s world. This grant of authority is a marketing technique used by brands to sell goods and services. Next Best Action Marketing (also known as “next best” or “best next action”) is a strategy that considers literally “the next best” step In the marketing process. It’s important to add this facet of marketing to every plan. Why? Because setting a plan in stone from the start only leads to missed opportunities and no one wants (or can afford) that type of marketing. Considering the next best action shows how important adding relevancy and timeliness to your campaign can be. For instance, If you launched a plan focusing on millennials ready to travel after college, and Trump (President 45) purposely begins a new scheme to stop those Americans from traveling outside of the United States. You may want to create a step in your plan that shows cases how you feel about that ban. That shows relevance, purpose and all brands should be ready to add to their marketing plan through relevant tactics. Next, best action can be an offer, proposition or service. It is all dependent on what your consumers need/want and how the brand (that’s you) can adhere to these requirements/want. Improving one on one engagement through analytics and optimization increases value for not only your brand but also for the individual consumer. One of the most important (and in today's times) most critical process that every person should be interested in creating. Your PERSONAL BRAND. This method of branding is essential for any individual interested in being remembered. Competition these days are relentless in creating tactics that stand out. From looking for employment to keeping your job, personal branding could absolutely make a difference in how people perceive WHO YOU ARE. Taking a step into personal branding can be a bit overwhelming. Mainly because you are taking a step into melting your outside world with your personal world. It’s like using a prism and actually standing under the sun to showcase your many talents, skills, and techniques. And, to be honest, even your flaws and failures. It’s your story, and it can never be duplicated. Let’s get back to the purpose of branding. Well, the purpose of branding that I specialize in. The ultimate connection of your audience emotionally connecting (and becoming loyal) to who and what you represent. In the visual sense, branding has to be consistent, creative and streamlined. No argument there. However, when it comes to the emotional connection of connecting with your audience, you must consider what you say, do and even how you feel about your brand. An inconsistent journey only leads to an inconsistent audience. Believe me, I know. The best way to go about personal branding is through authenticity and consistency. Knowing the image, you want to portray and shooting for the stars. Market yourself, at any age. Market Yourself. Yes, this a thing. This is a relevant thing. This is something that people do and not just businesses and entrepreneurs. Having a prop as a form of publicity can range from holding up a business card to take a picture at a club to doing an international campaign for Mac and holding up the newly released lipstick from a new campaign. This form of publicity is relatively inexpensive and can hold a powerful punch when strategized. The purpose is limitless. Social Media today makes this tactic especially attractive to those who seek media attention or those that would like to cultivate visual media. Either way, no matter the media used, adding a prop can make your brand explode or impede. To accurately use a publicity prop consider an accessory that’s related to your personality, your purpose, product or service. Using anything to fill in the void of needing publicity isn’t the best idea. I am sure you can think of plenty of brands that have “incidentally” used props that don’t fit their image. So, it is best to give thought to who you choose to publicize and who you want to work with. Everyone doesn’t fit your brand. To best describe Affinity Marketing you must first understand two things – Affinity Groups and Customer Affinity. Affinity groups are a cluster of people who share a common goal or interest to which individuals formally or informally belong. Examples of groups could be private social clubs, fraternities, sports teams or even a group of activist. They can be based on shared ideology or just simply share the same concern. Customer Affinity is a personal or emotional connection forged between customers and a particular brand of business. Gaining affinity for a particular brand basically means being highly successful in achieving brand loyalty and growth. Your consumers know you(your brand) for x,y and z purposes. This makes the question: “So, what exactly do you do?” easier to answer and twice as easy to understand. Now that we know those two definitions lets discuss Affinity Marketing. This particular concept consists of a partnership between a company and an organization that brings together a group of people that have the same interest. Before creating an affinity group, it is best to first define your market and segment those customers into solvency and receptivity of your goods and services. This is just a fancy way of saying, who are you and why are you here. Secondly, you want to focus on a type of recognition for this affinity group, what will make this particular group feel important while also amplifying their message. So, the next time you see a major facet of business like, hotels, retail outlets, airlines or supermarkets cater to a particular membership organization, non-profit of particular demographic know that an affinity marketing campaign has been launched and may be catering to the likes of you and your demo. Kind of like Kylie Jenner and Pepsi – in that realm, except it actually works. Sidebar: You may think that this is similar to co-branding. It is not. Co-branding has many different arrangements as part of one campaign. This process is more of an alliance.Building brands together to form a partnership that will embed an audience for a lengthy period. This form of marketing can be defined as a digital technique built for the ages. Digital networks allows for this emerging technology to easily become a marketing strategy for those that desire. CRM is dependent upon the proximity of other networks/businesses that will allow you to promote goods and services through Bluetooth technology. Wifi and FM are also transmitters that can be used to spread your marketing message to the masses. Also known as Proximity Marketing, this technique is perfect for pop-up shops, events and retail store locations. If the transmitter on both ends are within range sending an audio file, image, text or video can be received. More than ever this type of marketing is allowing for important consumer behavior to be understood, recorded and used to the benefit of the brand. A newer form of marketing that can be used in real time with real responses. From nightclubs to airports this is technique to keep on your radar. Post in the comments if you have any new concepts, innovative practices or general brand ideas that will help the entrepreneurship community. Email me at info@thebrandingicon.com or call 757-944-8670 to book a consultation. Most of you have had dreams or aspirations of starting a business and somewhere down your dream of success you can picture yourself on Good Morning America giving advice on how to be successful to millions watching. That’s positioning your life for an expert platform. EXPERT: that’s a lot to ask for, right? In the arena of experts, coaches, and consultants I know it’s hard to come by someone who has the perfect portfolio. I know when people see me they think:” Well what makes her a strategist in branding”? …. It could be a lot worst what people think of me but I’m not here for that. I’m here to talk about how you can further credential your expert status. As a television account executive I immediately noticed that most of my clients were only concerned about how many phone calls they received or who was actually coming through the door. Rarely, did I have a meeting about strategy. Rarely, did I have a meeting about how they would handle the amount of work once the consumers actually came. Rarely, did we entertain a conversation about their brand identity and how their commercial could last beyond a 12-week stint. Now, as a Television Production/Broadcast Major from Norfolk State University (plug) – it was super important for my clients to have high production quality, a unique creative strategy, a successful advertising campaign and a decent amount of digital leverage. With all of these factors being important to me one client specifically changed the format of our meeting to discuss how I can fill in the void. This is when I knew I had SOMETHING. Often, when someone tells me their vision I get so very excited for them because I know they are giving the business world something that has been missing. It’s a great filling to have. So when positioning your brand for ICONIC success be sure to fill in the void and give the people something they have been missing. Even if they didn’t know it wasn’t there. I come from a full gambit of media, entertainment and public relation positions. When it comes to my field I look for people that understand and can speak my language. Now I have been told that my lingo is more Madison Ave. and I need to bring it down to (Virginia Beach Blvd). (Wooo – was that a hard pill to swallow). I took that advice for what it was worth but I still have a fire in me to connect and build with others like myself. Either way you put it, when you are building your brand in your desired industry check out forums, blogs, private Facebook groups, hashtags, etc. etc. to get the full effect of what your industry language is about. I would hate for you to speak expired lingo because you got a best seller book from the 90’s as your informative driving force. The language is constantly changing. Speak it often and educate your network. Wouldn’t you rather work with someone that has their finger on the pulse? This was a tough one for me to follow. Experts don’t become successful by being scared to decline an idea or notion. With the decline be sure to give several ways on what can work. What can happen. This also goes for when a particular business would not make a good client for your company. Just like they have the power to choose you – you have the power to choose them. Just like any other partnership. It has to work both ways. If you are afraid of the waves that may be created, then this may not be the field for you. And if you are in need of the check and only thinking about the $$ signs in saying yes to any client. Believe me, you would regret it the second you start the work. Stick with your gut when working. Say No, Give Reasons why, and configure your way to success. This should go without saying. What makes you the business people should give their hard earned money to? Give reason, give proof, give testimony. Some consumers actually do research your credentials and interview potential expert prospects before they move forward. You also have consumers that can make a split decision on who they want to work with just off of a social media profile and a few tweets. Either way be prepared to readily give your credentials when asked. For me, I just keep my character references and testimonials on my website. Experts have to be remembered. After all, you’re giving reason for people to change their lives. When marketing your business be sure your brand properties stand out and are distinctive. This goes for every aspect of your business, be sure it is seamless. Be sure that your branding blueprint is embossed in your authenticity. Well, that’s why you have people like me. So, I’ll just stop here.